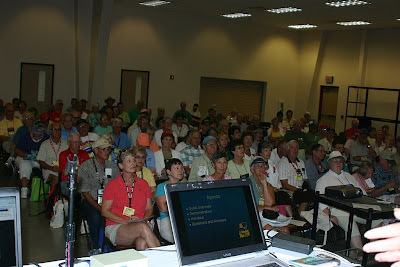 Even on the 3d day of our seminars we had large crowds. This is just a third of the room for Jim's Google Earth seminar! The room monitors told me they counted at least 400 people for the Picasa seminar. Here's Wayne and Vivian. I wonder if they would have chosen those seats if they knew I always use a couple in the front row to demonstrate taking a picture and uploading to Picasa Web Albums?! 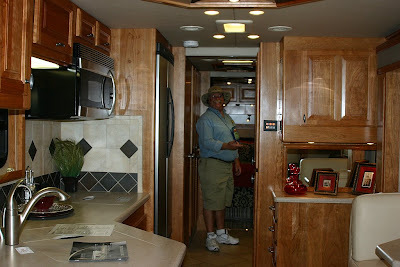 We took a couple hours off one afternoon to go see some of the motorhomes on display. I believe the price tag on this one was over 500,000. Sure is pretty. Jim and I took turns monitoring the WiFi hotspot on the last day so we could each pick one activity we wanted to do at the rally. I went to 'Mac the Fireguy's' seminar on fire safety. This is something I've wanted to do for the last several rallies we've attended but never got around to it. I learned a lot. Now we have to buy the foam fire extinguishers. Check out his website and you can learn too. This is important stuff.